Esta es el área de 850 hectáreas que sería inundada y donde estaría Embalse. En la imagen se puede ver el actual Canal Oeste, el Trasvase Piedras, el Río Piedras y el sifón del Río Piedras. 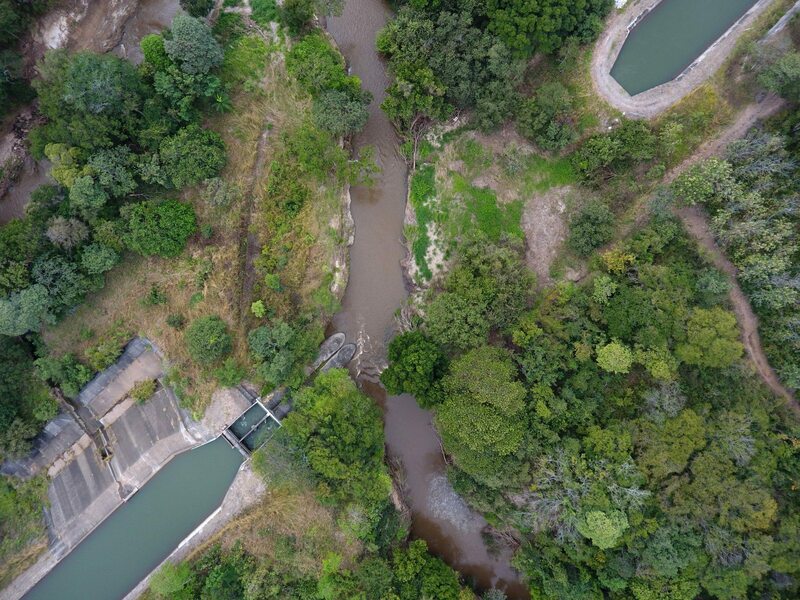 A new $500 million project by the National Service of Groundwater, Irrigation and Drainage Service (in Spanish, SENARA) promises to bring water to 1,000 farmers and ranchers in Carrillo, Nicoya, and Santa Cruz in 2022. The water will come from the Arenal reservoir. How do they guarantee efficient use of the water? In a province that will face more droughts in the future and whose agriculture inefficiently consumes water, this is a necessary question. However, the answer isn’t that simple. 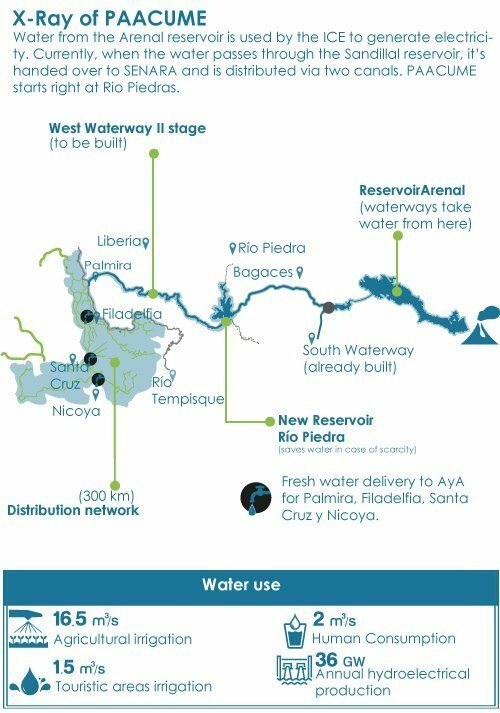 Although the Project for Supplying Water for the Middle Tempisque River Basin and Coastal Communities (in Spanish, PAACUME) promises to distribute water fairly among small and large farmers, they cannot guarantee that landowners will use the water efficiently. Each farmer will decide how to use the water depending on the type of crops they plant, their irrigation techniques, and its profitability. If someone decides to use flooding irrigation (a system that the AyA has classified as inefficient), they can. SENARA is betting that the price of water will be a factor that could persuade farmers to make more efficient use of the water, but the rate is in the hands of the Public Services Regulatory Authority (in Spanish, ARESEP). Currently, farmers only pay ¢60,000 per hectare in the Tempisque Arenal Irrigation District (in Spanish, DRAT) which is made up of the cantons of Abangares, Cañas, Carrillo, Bagaces, Liberia, and Carrillo. Like PAACUME, they also get their water from the Arenal reservoir. “If a farmer wants to plant rice, which consumes a lot of water, then he’ll have to pay more because it consumes more water in a smaller area. This affects their profitability. We assign a maximum amount of water based on volumetric cost,” explained Coto. Jonathan Castro agrees with Coto. Castro is a specialist in technology and innovation and climate change at the Inter-American Institute of Cooperation for Agriculture (in Spanish, IICA). To Castro, charging for the volume that each user consumes could make Guanacaste’s farmers use water more efficiently. “A rate based on the volume of water used could be the first incentive or persuasion for users to be more efficient,” said Castro. In addition to agricultural irrigation, PAACUME will provide water for human consumption, electric generation, and irrigation in tourism zones. Jonathan Castro, the IICA’s specialist, explained that in order to achieve efficiency in the production and management of water the farmer must take the initiative and join together with other farmers and governmental institutions. “They can be groups of users, associations, cooperatives, but do it collectively and not just wait for the government to come and tell me what to do or to train me,” said Castro. The ability to adapt to climate change will be a variable that will determine if the farmer is using water efficiently, said Edwing Quirós, a specialist with the National Institute of Technological Innovation and Transfer. “Efficient use of water is related to the type of crop, soil, and climate. This determines how much water and what system of irrigation is needed,” said Quirós, whoo is the coordinator of the Enrique Jiménez Núñez Experimental Station, located in Cañas. One farmer who has had to adapt to the consequences of climate change is Andrés Vázquez, at the Los Sukias Cattle Ranch, in Cañas. He is one of the beneficiaries of the water that DRAT provides as his farm is near the canals. On his 133 hectares, Vásquez plants rice without pesticides, organic sugarcane, and grass for grazing. He explained that his technique for irrigating rice is a system he calls “mojes,” or “soakings,” which consists of soaking the ground for a few hours on certain days. This reduces water consumption. “This technique has reduced my water consumption by 50%. Now I only use 1.5 liters per second for rice,” said the farmer.